If you're looking to hook into a number of hard fighting fish, it is hard to beat fly fishing for American Shad. On the West coast, the American Shad, Alosa sapidissima is usually referred to as "Shad". "Poor Man's Tarpon" or "Poor Man's Salmon" as they are also called, generally start running in serious numbers up the Columbia around Memorial Day and continue through the month of June. During this time period, it is not uncommon to catch as many as 40 fish per day or more. It is on this return trip to spawn in late spring to early summer that fly fisherman have a wonderful opportunity to pursue one of the world's best fighting game fish. Fish counts over Bonneville Dam vary from year-to-year but the annual tally generally ranges from 1 to 3 million fish. When daily counts exceed 15,000 or more it's time to hit them. You can check the daily counts over Bonneville Dam by utilizing the following link: http://www.fpc.org/CurrentDaily/7day-ytd_adults.htm. The American Shad is a member of the Herring family and is primarily a planktivore. Just like Salmon, the American Shad is anadromous, or ocean going. They begin their life in fresh water where they spend approximately 8 months before they migrate to the sea where they mature. Male Shad reach sexual maturity at 3 years of age and females reach sexual maturity at 4. Sexually mature fish begin migrating up their natal streams to spawn when the water temperature is between 50 and 60 degrees. Shad are pelagic spawners, that is, they release their eggs into the current as opposed to digging out a place in the gravel to lay their eggs. Spawning activity takes place primarily during the evening and nighttime hours. Unlike Salmon, Shad do not die after spawning and may survive to spawn multiple times during their lifetime. Male Shad average 2-3 lbs. and arrive a week or two before the females which average 3-6 lbs.. Although Shad can be fished from the bank, it is very beneficial to have a boat to put you onto fish. The flows of the Columbia can be very strong and this is no place for inexperienced boaters. The wind can create dangerous conditions and wind waves in excess of 4 feet are possible. Be sure to wear your life jacket at all times. In addition to a boat, a fish finder will often help you locate fish and/or give information about what depth they're holding. Some of the best places to target Shad on the Columbia river include the Camas Slough, the mouth of the Washougal River, the upper end of Lady Island, Cascade Island, and of course the area directly downstream from Bonneville Dam. If you don't have access to a boat, a little hiking may be necessary to get away from the crowds but you will be able to find your own piece of water on the Columbia. If you have access to a boat, you have miles of river to explore. 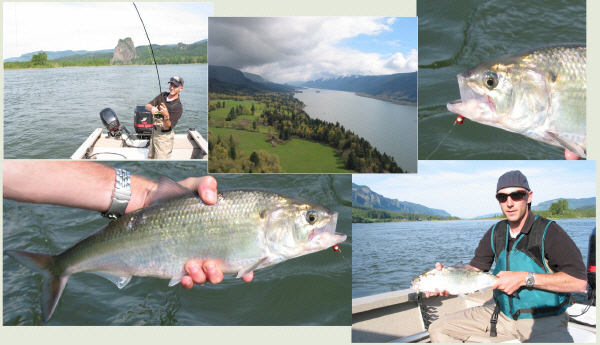 Many of the small islands on the Columbia have ideal water to pursue Shad with a fly. The best places to fish for Shad are where relatively fast current push the fish close to shore. The Columbia is big water and it takes some time to read it. Look for the current seam between the fast and slow water to present your fly. Generally speaking, Shad can be found in water 6-12 feet deep and this will require fast sinking tips to get your fly down in the heavy current. As their holding depth may vary during the day, it is important to continue to adjust your sinking tips to match the depth of the holding fish. Shad can really put a bend in a rod and it is recommended that you use at least a 7-weight rod to fish for them on the Columbia. The 7 weight will not only help you bring them in faster but helps tremendously when either the wind is blowing and/or for throwing heavy tips. You have to dial into what the Shad are looking for, what depth they're holding and what color they're keying into. Shad generally follow the contours of the surrounding banks and are most often very deep. If you're not hitting the bottom and snagging up occasionally you're not fishing deep enough. It helps to have a variety of flies, red/white, chartreuse/white and purple/white for starters. Shad can be fussy about flies and it is not uncommon for Shad to be the most aggressive immediately after changing fly color. Like trout fishing, if you're not getting hits you're either not down deep enough or you're not using the right color. The wet fly swing is the most effective way to fish for Shad. Throw your heavy sink tip upstream at about a 45-degree angle and let the fly continue to sink without drag until it is hanging down below you. Once the fly is below you, wait 20-30 seconds before recasting as Shad will often take the fly on the dangle. Shad strike the fly with a vengeance and it is easy to over-react and set the hook so hard that the fly rips through the thin membrane around the mouth. Due to the ferocity of the strike, Shad automatically hook themselves. You'll know when a fish is on and from that point on, just reel them in. Applying too much pressure will result in lost fish. Time of day is very important to the success of catching Shad. Generally, early mornings will out produce afternoons and evenings, especially during sunny days. During cloudy days, it's possible to catch Shad throughout the day. During the evening hours Shad often become preoccupied with mating and may not pay any attention to your offerings. Another benefit of fishing early, especially on the Columbia, is that wind is generally not a factor early in the morning but that usually changes for the worse as the day progresses. The Columbia River Gorge is the wind capital of the world and at times it can blow you off of the water. Shad are considered a delicacy on the East coast and the roe is highly sought after, however, on the West coast they are generally not used for culinary enjoyment. Most of the Shad that are caught on the Columbia are either released or retained to use as bait for Sturgeon and/or for Crabbing. There are a number of sites that have recipes if you're inclined to keep a few Shad and give them a try. Currently, there is no limit on Shad but that doesn't mean that you shouldn't take care to release them properly if you're not going to keep them. 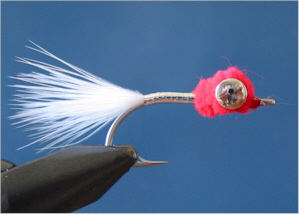 The fly you see pictured below is a good example of the kind of fly that you might use for tempting Shad. This is a variation of a fly called a Shad Dart. Body: Large Mylar, silver side up. Head: Red Chenille. Other good colors include chartreuse and purple.